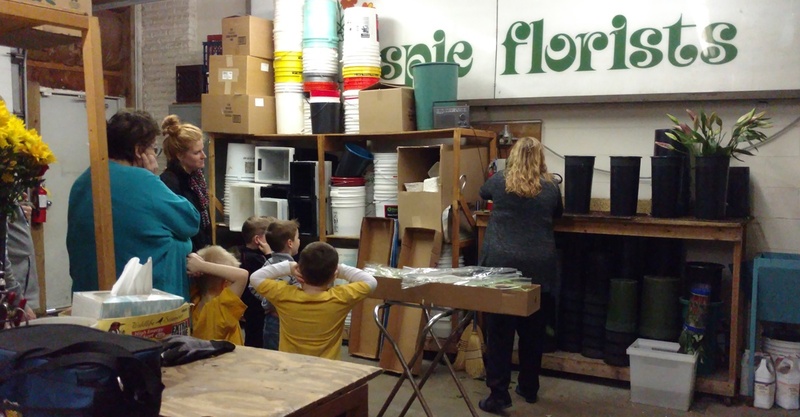 Field Trip with Flowers at Gillespie Florists! Field trip at a flowershop?! Yes we can! 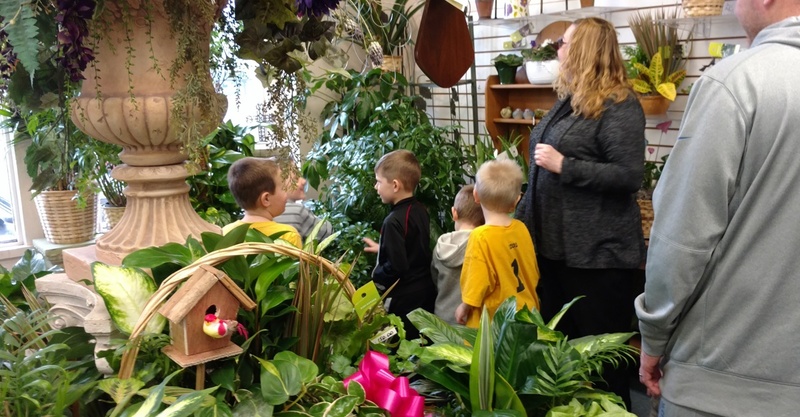 Gillespie Florists offers an exciting, informative and hands on experience around the store in a field trip format for everyone to enjoy! Let's take a look at how our friends from Our Shepherd Lutheran Church Preschool enjoyed their visit with us! Sarah, Gillespie Florists Manager and Owner coordinated with the teachers at Our Shepherd and our own staff to ensure a safe, educational and fun visit for the class! With an approximate class size of twenty kiddos and a few parent volunteers, Sarah chose to divide and conquer by splitting the class into two groups and switching halfway through the field trip for plenty of time to tour the entire building (including a chilly walk through our 500 sq ft cooler), make bouquets, sign cards, and even smell the roses! When visitors walk through our door and into the main display room, the first thing they will see is the service counter where our friendly CSRs help customers make their selections. With a large video display installed, customers and staff can also surf our website together to find the perfect arrangement for any occasion! It's a jungle out there with all of our lush green plants! Sarah walks everyone through the different areas of the display floor including the small cooler and gift section in the entryway; the adorable wall of plush; and our lovely garden of a plant display which leads to the red carpet into the design room, cooler and delivery area! When the delivery vans aren't parked inside the garage during the evening, it is transformed into a flower processing room during the day. The class enjoyed an exciting demonstration on how we clean leaves and thorns off of roses using a special machine, cutting stems, and help them soak up water and nutrients in buckets before being placed in the 500 square foot cooler or out on the display floor! The students also had an opportunity to check out a delivery van and how bouquets are loaded in the vehicle for safe transportation. While the Group One toured the store with Sarah, Group Two made little bouquets to take home and give to a loved one! 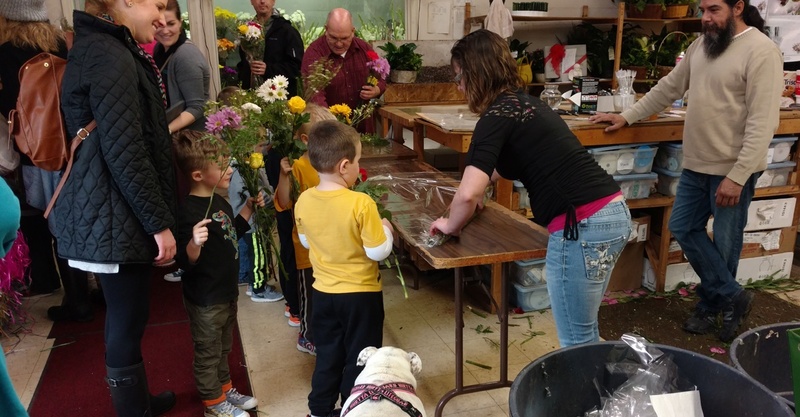 Gillespie Florist staff member Curt helped with the selection of roses,carnations, daisies, and babies breath while Robyn gave a quick lesson on wrapping bouquets in cellophane! 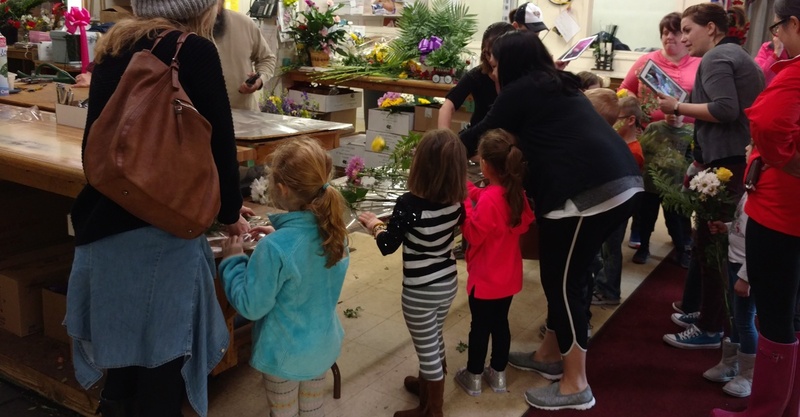 After Group One finished their tour of the store with Sarah, they jumped in on the fun of selecting flowers and making a take home bouquet! Everyone signed cards for their gifts and the visit was successfully finished! 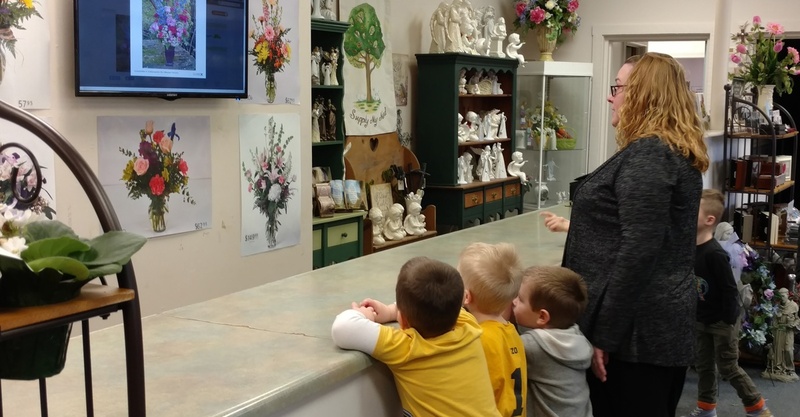 As you can see from the photos, everyone had a wonderful time and Our Shepard Lutheran Church Preschool was kind enough to share photos from their experience on how the class put their knowledge to work by setting up a flowershop in the classroom. What a wonderful idea! Want to learn more about the preschool and their class tour? Check it out here! Interested in doing a tour at our store? Give us a call at (317) 273-1100 or email gillespieflorists@gmail.com!